I’ve been wanting to do something with artichokes for a while, but fresh one’s are pretty pricey. I found these great frozen ones at Trader Joe’s that taste great and retain all of their nutrients. 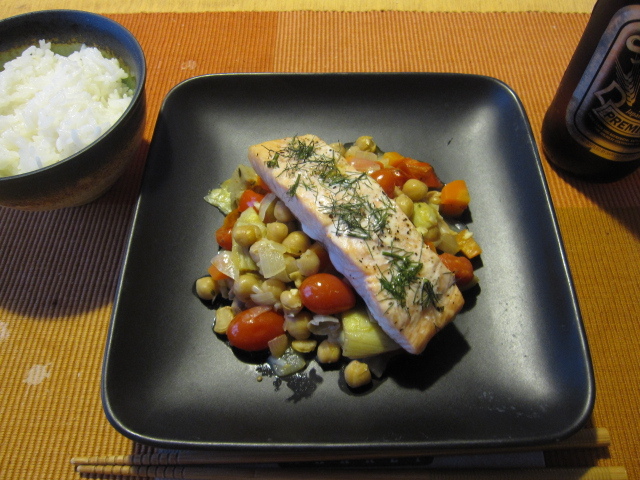 I whipped this salmon dish up to get them into our guts. This is a really easy dish that can be made within a half hour or so. 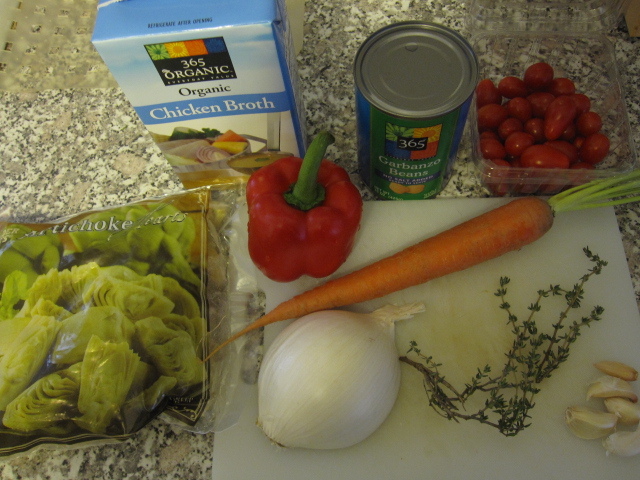 I took 1.5 cups of the frozen artichokes (about half the bag) and rinsed them real well, 1/2 cup of chicken stock, 1 red bell pepper diced, 1/2 onion diced, 1 carrot diced, 1 14oz can of chickpeas drained and rinsed, 1 container of cherry tomatoes, 1 large sprig of thyme, and 5 garlic cloves minced. I poured about 2 tablespoons into a heated pot and added the garlic. I let that go for about 30 seconds and then added the onion. The onion sweat for about 3 minutes and then in came the bell pepper and carrot. Once that all sweat down for about 5 more minutes I poured in the chicken stock and seasoned with some salt and pepper. 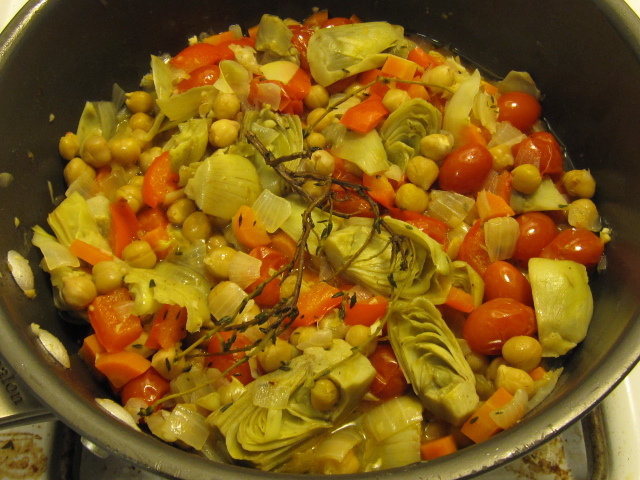 When the stock started to slowly boil I added the artichokes, chickpeas, tomatoes, and thyme. I covered the pot, turned the heat to med-low, and let it simmer for about 15 minutes. 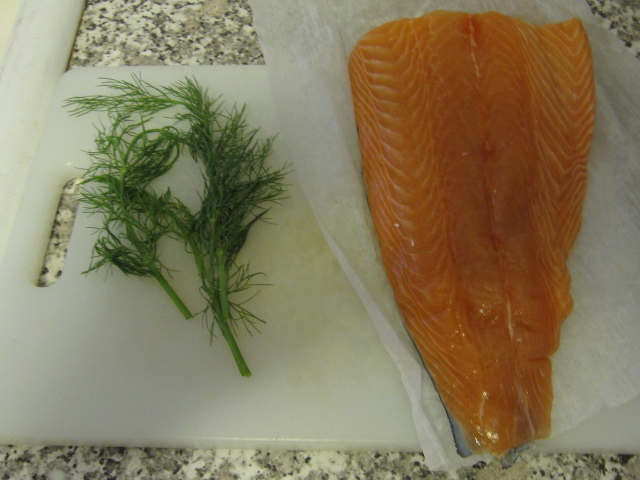 For the salmon I simply used some chopped up fennel fronds and about 3/4 pound of salmon cut into 4 portions. 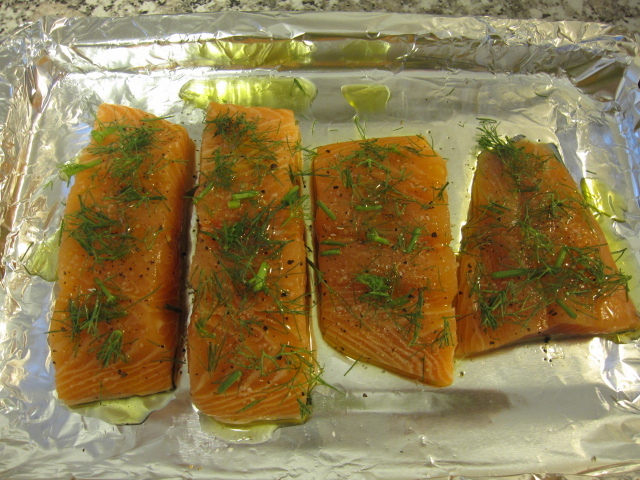 I seasoned the salmon with salt and pepper, then topped it with the fennel and drizzled some olive oil all over it. I threw it into a 375 degree oven and let it go for about 10 minutes just until it was cooked through. I tasted the artichoke chickpeas mix and adjusted the seasoning accordingly then ladled a big scoop onto the middle of a plate. I placed a piece of salmon on top. White rice was on the side, along with a cold beer.